According to the 2019 Content Marketing Benchmarks report, roughly 50% of all marketers expect to invest more in content marketing this year. If you’re not in the half of marketers preparing to up their investment, or you’re still debating the idea, this article will hopefully show you why it should be on your priority list. To give you a better idea of the role content marketing plays in your wider marketing strategy, we asked our specialists to answer the most common questions they get asked. Here’s why it’s worth the investment. Content marketing is the strategic process of building valuable relationships with audiences through various types of media. This is where you craft the stories and messages that capture people’s attention and guide them along the consumer journey until they become another happy customer. While many strategies focus on a single channel (e.g. social media), content marketing is a multi-channel approach that integrates with your SEO, social media and email marketing efforts. These channels act as platforms to deliver your content to the right target audiences. The aim is to create a strategy that guides users towards purchase as they move between these channels. Content is the substance of everything people do online before making a purchase – from the very first search to the moment they hit the buy button. Without content there are no web pages, search results, online reviews, demo videos or anything else that helps people make buying choices. In a world where people are overwhelmed by purchase options and bombarded by ads, content marketing allows you to connect with your target audiences on a personal level and guide them towards buying from you. 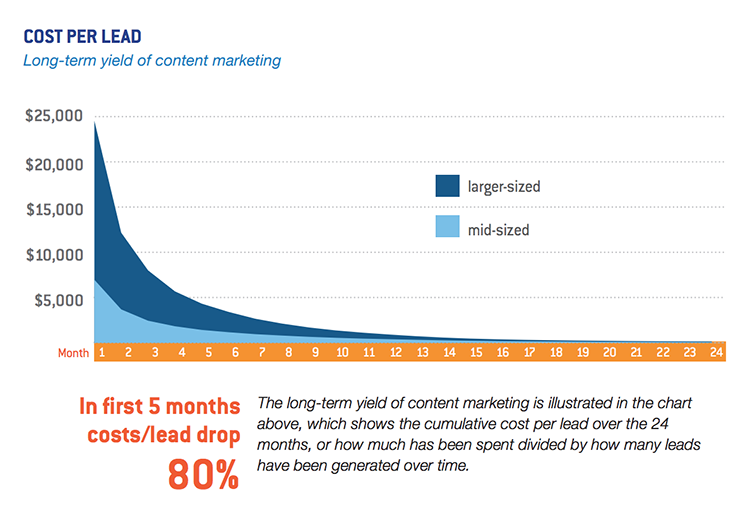 Your other strategies are also going to fall pretty flat without content marketing too. Good luck trying to hit your SEO, social media or email marketing targets without integrating them into your wider content marketing strategy. Above all, the key benefit is guiding people towards buying from you with confidence. When there are hundreds or thousands of other businesses like yours that people could buy from, content is how you differentiate your brand and show them why they should be doing business with you. Meaningful relationships: A successful content marketing strategy builds meaningful, lasting relationships with people likely to buy from you. Trust: These relationships earn the trust of your target audience, which is crucial when it comes to choosing who they’ll buy from. Engagement: Keep your target audience engaged over a long period of time so your brand becomes a valuable part of their lives and the first one they think of when they need what you’re selling. Awareness: Grow your audience to increase brand awareness and earn more customers. Branding: Allows you to craft your brand story, differentiate yourself from the competition and demonstrate what you can do for people that your rival brands can’t. Repeat purchases: Keep your audience engaged and excited about your brand after the initial purchase to turn them into repeat buyers and brand loyalists. ROI: Over time, content marketing should be your most cost-effective lead generation and nurturing strategy – another key finding from the Kapost and Eloqua study we linked to above. Another important benefit is that it’s a truly multi-channel strategy. It allows you to target people on their favourite channels (Google, Facebook, Instagram, etc), different devices (mobile, desktop, etc) and platforms (browser, in-app, offline, etc) and create a single strategy that reaches them at every stage of the consumer journey. It allows you to pave these consumer journeys in front of your target audiences, reach them every step of the way and provide the message they need to take that next step. As with any kind of marketing strategy, you need to be able to measure your results to prove its success and find opportunities for improvement. Before you can do this, you’ll have to know exactly what your content marketing goals are and which KPIs illustrate success or failure. As you can see from Content Marketing Institute’s (CMI’s) The Complete Guide to Influencer Marketing, the metrics you need to measure vary depending on what you’re trying to achieve. The biggest mistake marketers make when it comes to measuring success is chasing the wrong metrics to begin with. Once you’ve identified the right metrics, your biggest challenge is going to be attribution. How do you know that blog post is generating leads or how much of the traffic from those social media campaigns is resulting in conversions? This becomes increasingly difficult with a multi-channel marketing strategy where one piece of content doesn’t necessarily achieve any of your goals but might still contribute towards them. You need to be able to identify which pieces of content are adding value to your marketing efforts and which platforms users are using as they move through the consumer journey. To achieve this, you’ll need to pull in data from all of your channels (Google, Facebook, email, etc) and attribute engagement across all of them to understand how people are interacting with your content as they move along the path to purchase. 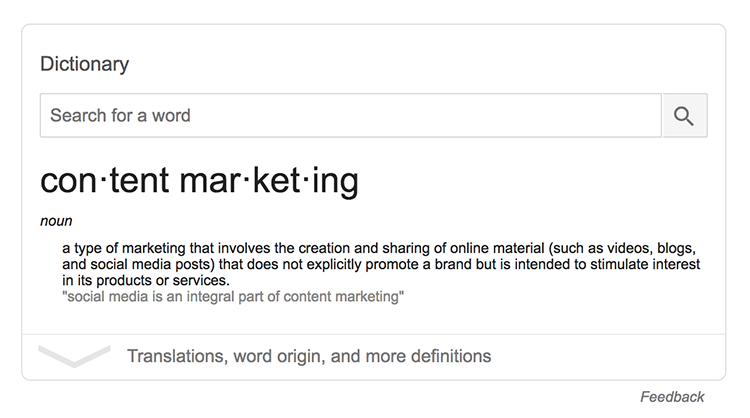 How is content marketing different to SEO? This is a common question and it’s important to understand the difference to do both effectively. Content marketing is a broad strategy that targets users across various channels (search, social, email etc) and engages users as they move between them. Without these channels, nobody would be able to see your content and a key part of your strategy is understanding which channel(s) to deliver each piece of content on and how to target users on them. SEO is about making your content as accessible as possible for search engine users and helping it perform effectively. This starts with optimising your pages and content for visibility in the searches that matter most but also involves broader, technical factors that affect how people engage with your pages (mobile optimisation, loading times, etc). Why does my business need a content marketing strategy? According to research from CMI, 91% of businesses say they do content marketing but only 37% say they have a documented strategy guiding their efforts. With this in mind, it shouldn’t come as a surprise that only 9% of B2B marketers describe their efforts as sophisticated, according to the same study. Without a strategy, you’re shooting in the dark – you have no way of measuring performance or spotting opportunities to improve results. Keep in mind that effective content marketing requires an understanding of which platforms your target audiences use, what their consumer concerns are and how they move between different channels as they progress along the consumer journey. Once you have these insights you can craft messages for each stage of the buying process that address user needs as they change and encourage them to move on to the next step. You can also determine where these messages need to be published, which content format to deliver them in (blog, video, podcast, etc) in order to move people along your sales funnels. Crucially, you can also measure results for an overview of how your entire strategy is generating and nurturing leads. This tells you what’s working, what’s not and where new opportunities are hiding. What kind of results can I expect from content marketing? This depends what your needs/goals are. For example, an online news portal looking to build its online presence will have very different goals to a small business looking to increase its customer base. Brand awareness: You should be seeing more traffic from search and social, more referral traffic from third-party sites (via links) and an uptake in brand mentions across the web. Engagement: Over time your content will get more likes, shares and other engagement on social media, as well as more inbound links from third-party sources. Search visibility: As your content marketing strategy matures, your pages should rank higher in search engines for your target keywords and your overall domain authority should also increase. Authority: As your strategy matures, your brand will build more authority within its industry and earn trust from a wider audience of people. Lead generation: You should be generating a higher volume of leads from search, social and potentially offline as well. Lead nurturing: A higher volume of leads turning into customers as your content marketing strategy guides them along the buying process. Customer retention: A higher proportion of customers buying from you more than once. Return on investment: A solid strategy should always pay for itself (and then some). It’s important to have a solid understanding of what your real goals are and to stay focused on them. A common mistake marketers make is looking at the wrong KPIs or getting distracted by other goals. For example, if your aim is to generate more leads then increasing traffic is probably going to be one of your objectives to make this happen. But getting bogged down in traffic numbers can take your attention away from attracting the right kind of visitors or increasing the percentage of users who convert into leads after landing on your site. Higher traffic numbers don’t always equate to more leads – so make sure you know what you’re really trying to achieve. 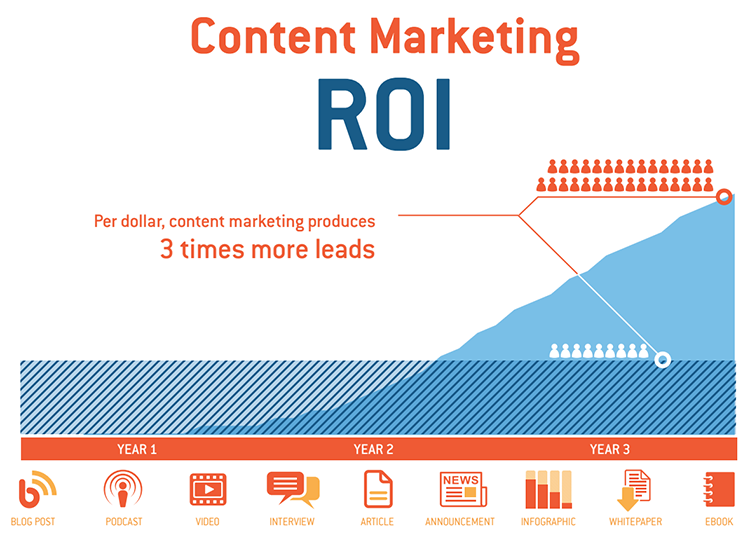 What return on investment (ROI) can content marketing deliver? According to data from HubSpot’s State of Inbound 2018 report, 41% of marketers or marketers say content marketing yields a significant ROI – which is very high considering most marketers don’t even seem to have a strategy. The image below shows content marketing generates 3x more leads than paid search per every pound spent – Content Marketing ROI study from Kapost and Eloqua. Calculating your ROI depends on how much you’re going to invest, what your goals are and a number of variables such as customer acquisition cost (CAC), the price of your products/services and the profit you make for every sale. This is difficult to answer as it depends entirely on the type of content, what you want to achieve and how quickly. As we mentioned earlier, content marketing should become your most cost-effective strategy, once it has time to mature. In theory, you can do content marketing on almost any budget but it’s important to consider the time and other resources involved in creating a strategy that works and producing the right kind of content that gets results. Also, keep in mind that the high-ROI nature of content marketing means you should always consider the return vs your initial spend. Sometimes it’s worth investing more to make more and it often pays to get results as soon as you possibly can. For example, it’s generally much harder for a brand ranking below you to overtake you in the SERPs than it is to maintain your position above them. Likewise, search competition is always increasing and stealing leads from your rivals after they’ve already established a relationship can be tricky. In this sense, the sooner you build a strong search presence the higher and more stable your ROI should be. It’ll be harder too for competitors to knock you off your spot in search. Hopefully you’ll be spending less to convert leads into customers, thanks to having a stronger search presence boosting your content marketing efforts – all of which increase your ROI further.